Sitting inside the theater, Oracle Productions Executive Director Brad Jayhan-Little shares the story of “public access theatre,” a term he coined. He runs the theater on Broadway Avenue and Grace Street in North Lakeview with the help of his Min-Pin/Chihuahua mix, Kennedy, who's sitting in with him for an interview about Oracle Productions. Oracle provides theater-goers with live performances free of charge. Oracle Productions started in June 2006 and operated with a regular theater business model, charging for tickets and offering specials for half-price tickets. After 4 ½ years, it was time for change. From that thought process, the public access theater program was born. When developing the program, Little knew three things were important to him: more audience, more press and more donors. “When we realized that those were the things we were trying to do, we realized that one of the things we weren’t trying to do is sell tickets,” he said. Little said they tried a pay-what-you-can night and other incentives until one afternoon it clicked. “Oh, we just need to give it away for free,” he said. Deciding to operate on a donations basis, Little and his colleagues knew that door donations were not going to be the same as the amount of money they were making on tickets. They created a sponsorship program called The Forty 4 Oracle Sponsorship Program. 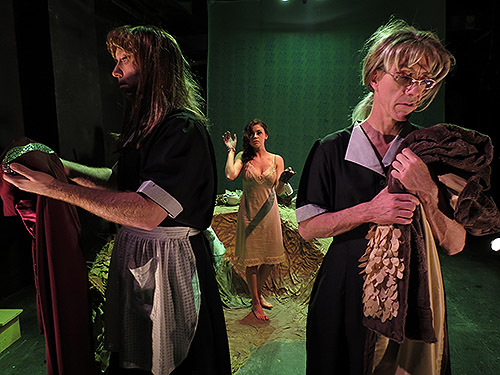 Little and his staff believe this model has proven to be very successful.They began a three-show season in 2010-2011, opening the season with Blood Wedding, and saw a 397 percent audience growth. The revenues of the theater remained steady and even with ticket sales replaced by donations and monthly sponsorships, it managed to make the same amount of money it made the year before. Oracle is still looking to other outlets as a means to raise money for their public access model. Starting Sept. 6, people can vote in a Chase Bank contest in which the bank will donate $250,000 to its favorite charities. Oracle is in the running and hopes that the money can continue to house more audiences and productions. The board of directors and people involved at Oracle are all on a volunteer basis. The actors are paid a small stipend for their performance, but basically are performing and rehearsing as volunteers. Dave Boren is the director of B*Sides, a branch of Oracle that allows other companies to put on a show in the public access model. If Oracle sees a performance group, artist, or a young theatre company with a unique show or idea but they don’t have the following or money to produce content, that’s where Oracle steps in and helps them. Oracle also has a community outreach program where it brings the art to audiences who cannot physically make it to a show. The company does performances with elderly in nursing homes and homeless shelters.